The Coalition for Community Energy (C4CE) is excited to run another series of webinars after our 2017 webinars showcased many of the questions in the small scale solar guide with answers and real life examples from our member groups. 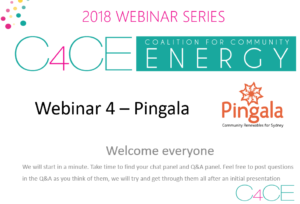 The webinars run from 6pm to 7 pm on Tuesdays during September, October and November 2018 and are generally related to the great work of our community energy groups. Recording webinars: We recommend you attend these event when they occur. 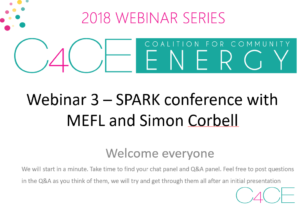 However, for those who can’t make it to a particular webinar we will be recording them and publishing them at a later date. To be informed when a recording is available for a particular webinar, please register for that webinar. 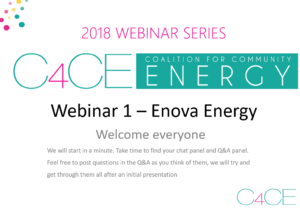 25 September 2018 Enova’s fundraise and their ambition to bring community owned energy retailing to all of us. Video and Q&A and our slides from the night can be downloaded here. 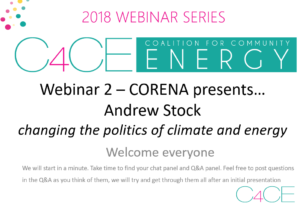 9 October 2018 CORENA presents… Andrew Stock and the politics of climate and energy. Video and our slides from the night can be downloaded here. 6 November 2018 Revolving Funds Rock! 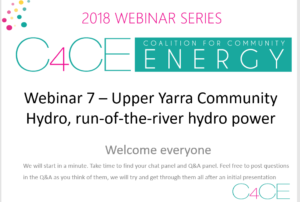 13 November 2018 Upper Yarra community hydro. The Upper Yarra community energy group is about launching its run-of-the-river hydro power station near Warburton. You can see the timelapse videos here. Come and talk to the project architects and partners. 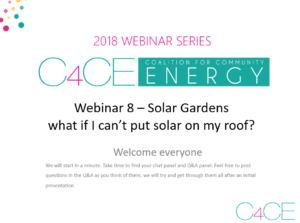 20 November 2018 Solar Gardens – how can I own solar power if I can’t put it on my roof? Community Power Agency and the Institute for Sustainable Futures are nearing the end of their social access solar gardens project. Come and hear from them and their two Pilot projects in Shoalhaven and Blacktown.